College professor Emma Grant blames Jane Austen for her ruined life. From reading Austen's novels, she was always led to believe in happy endings. A respectable marriage, a teaching job, promising plans for the future, and studying her favorite author. But when she discovers her husband, Edward, cheating with her teaching assistant, all dreams of a happy ending come crashing down. As if the affair isn't enough, Edward and the T.A. discredit her by claiming she plagiarized a paper. No job. No career. No husband. No hope. So she heads to England to seek revenge on Jane Austen. There, she meets a loony woman named Mrs. Gwendolyn Parrot, who claims to be in possession of lost Austen letters. Mrs. Parrot needs to be reassured that Emma is worthy of the prize, so she assigns tasks that gradually reveal secrets about Austen's personal life. I must admit that I'm not a big Jane Austen fan. It's not that I don't dislike her. I just have to be in the mood to read classic literature like Dickens, Austen, Bronte, etc. I much prefer the "fan fiction" or modern books based on the classic authors. 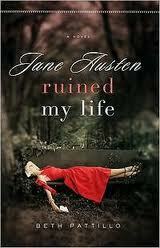 So Jane Austen Ruined My Life was a great choice. It mentioned facts in Austen's life, showcased famous spots in England and brings up good topics for book clubs. It didn't inspire me to pick up an Austen book in the near future, but it certainly was a great introduction to Beth Pattillo. I will definitely read more of her fiction, which I believe is based on Austen too. And let me add that her covers are quite striking. Are you an Austen fan? Do you read classic lit?